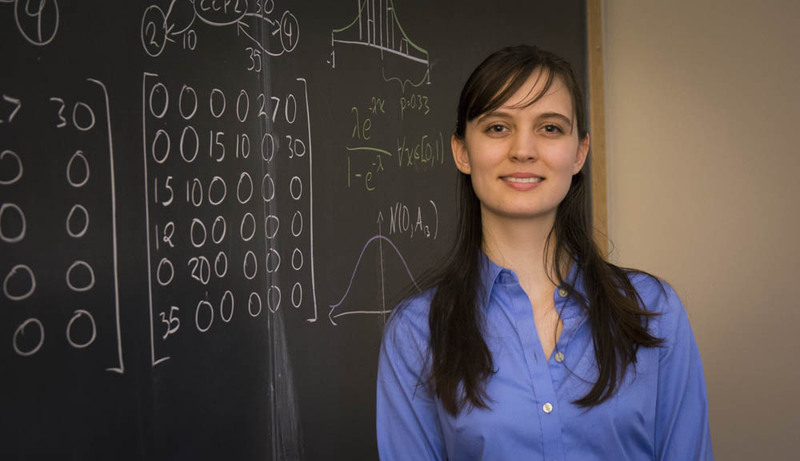 Senior Natalie Wellen knew she loved mathematical science, but she never dreamed the field would lead her to the complex, collaborative, multidisciplinary approach she was seeking. Natalie Wellen creates complex mathematical models to make predictions of policy effectiveness and more stable market outcomes. The first reason I chose to study mathematics was because I found it fun and relaxing. As I continued to study it though, I fell in love with what I recently heard described as "the unreasonable effectiveness of mathematics." I love how mathematics can be used to take something complicated in the world and create models that help us understand some of the simple factors that lead to complex results. I think one of the biggest misperceptions people have is that scientists work alone or don't prefer to be social. This is very wrong. In the field of mathematics people enjoy getting to know one another at conferences and working together on research problems. Just browsing through journal articles one sees that there are often multiple authors, and the same person will often work with a wide variety of other researchers. Right now I am working on my senior research project where I am trying to make a model of a financial trading system to determine if our financial regulations work the way we expect. Being able to take something we have very little information on and figuring out how to make useful predictions reminds me how amazing it is to be an #actuallivingscientist. ... question the world I live in. My dream job is to work in public policy. I want to use the mathematics I have learned and will learn to create models so that we know what kinds of regulations best meet our goals. I have met so many amazing professors and students at WPI who have helped me learn and grow as a mathematician and a human being. Further, WPI has already given me a chance to start living my dream because the research I am working on is modeling a part of the financial sector to test our public policies and see how they work.